We will establish Innovation Partnerships to develop flexible learning pathways that enhance the capacity of businesses to capitalise on the opportunities within adventure tourism. 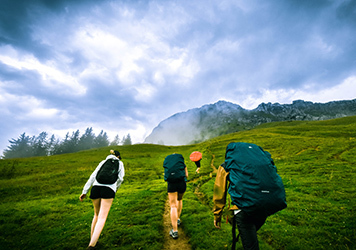 The Adventure Tourism Innovation Partnerships (AVIP) project aims to deliver high quality, highly relevant high level education and skills that support retention of high calibre staff in peripheral/rural regions. It will support the growth of SMART jobs to stimulate regional adventure tourism economies and business performance. Responding to regional skills gaps, the flexible learning pathways will up-skill graduates, entrepreneurs, and staff through HE learning that enhances their digital competencies and entrepreneurial capabilities to meet the changing needs within the adventure tourism industry. The Adventure Tourism Innovation Partnerships (AVIP) project is transformative since it creates lasting impact for HEIs and their graduates, entrepreneurs and businesses, particularly SMEs and their employees and responds directly to the transformational changes in sustainable tourism.